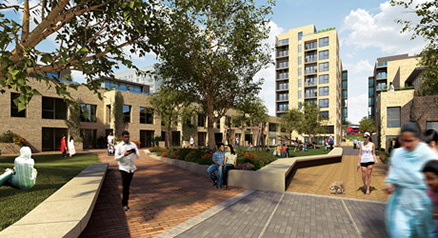 The Chobham Farm site in Stratford is located alongside Leyton Road, close to East Village (formerly the London 2012 Olympic Athletes’ Village) and Westfield Stratford City. The proposals include around 1,000 new homes, many with three or more bedrooms for families. There will also be affordable homes for local people, young families and older people as well as private and public open space. Parking will be provided for approximately 400 cars. TPP provided advice on the layout of highways and public spaces along with preparation of the Transport Assessment and Travel Plan for the planning application which was submitted in September 2012. The submission had not only to address the usual planning concerns of the local authority but also those of the London Legacy Development Committee, who have been responsible for ensuring that the optimum benefit is obtained from the adjacent Olympics venue. In travel terms emphasis was given to what is a highly sustainable location. The scheme received planning approval in July 2013.